Minister Business Cards are customized with your name and contact information. Full color printed and features ULC symbols on back. 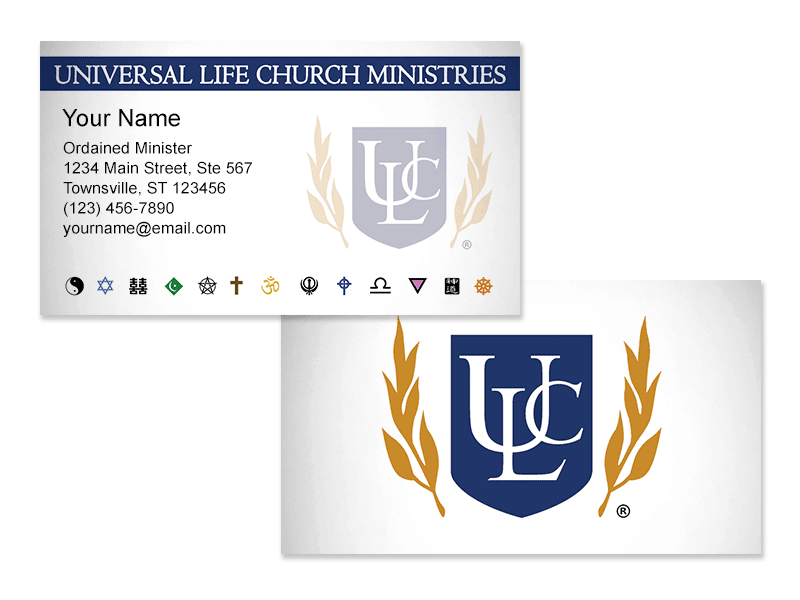 One of our newest products, the ULC minister business cards are one of the best ways you can launch your new ministry. The most convenient way to pass along your contact information to potential clients or congregation members. These cards are customized with your personal information. Your custom information will be printed with black ink onto double sided, color printed cards featuring the ULC church shield and the symbols on back. Add your name, your address, phone number and email address. DOCUMENT NOTICE: These cards are offered as a way for you to more easily distribute your contact information to those who would use it. It is not meant to represent that you are under employment of the Universal Life Church, and will not be accepted as valid legal proof that you are ordained if providing them to a governmental authority. You are an independent ordained minister. Please be sure to make this clear when interacting with any clients.